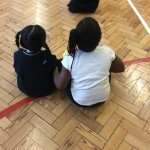 We had such a lovely PE lesson with Miss Meah, Miss Hale and Nursery. It was our turn to be the coaches this time! Today in Nursery we had our Go Go disco for sports relief. We danced, played games, and had party food! Nursery won stickers for their best dance moves, and boy what amazing dancers we have! Today is our first day that we run a mile a day. Year 2 are smashing it! Putting our skills to practice. 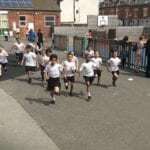 Year one were very excited during PE this week. Miss Meah helped us to learn how to use the apparatus. We climbed up safely – some of us even got to the top! We we just love to dance with Miss Meah. A brilliant day we had on Monday during sports day at KES. All of KS2 enjoyed spending the morning at KES where we took part in different activities, that included, javelin, 200m race, Javelin, and the clothes race. 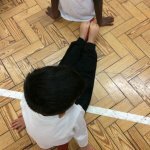 Take a look at some of our pictures. Tiverton Academy will be taking part in the Sainsburys School Games Handball Tournament at Shenley Academy this Friday. We are very hopeful of our chances in this and will report back on the games in next weeks blog!! GOOD LUCK GUYS!! We had a great day dressing up for Sport Relief and raising money! Thanks to the parents for the kind donations and also thanks to the sports coaches for organising such a fantastic week of events. Year 6 endured their fitness test on Wednesday…well done to you all for taking part. Year 4 took part in the a fitness test on Wednesday morning, they worked so hard and were exhausted by the end of it! It is very nearly time for the BBC’s Sport Relief day here in Tiverton Academy. This year as well as challenges for the children, we are working very hard on a challenge for the PE team here in school!! Watch this space for more details coming soon!! We are very excited here in the PE department as the BRAND new football kit has arrived!! We now look like a professional team with full kit and school badge on our new Adidas sponsored kit!! On Thursday 4th February, Years 3 & 4 will be taking part in the re-arranged football tournament to be held at Four Dwellings Primary School. We are looking forward to taking part in the competition and will be hoping to return to school as winners!! Lets go Tiverton!! Whose won the walking to school trophy? Yep you got it, YEAR 4, woo! Year 4 and 6 went to The Great Big Dance Off at The Alexander Theatre and guess who won?… YEAR 6, wahoooooo! They were amazing, well done! Year 4 performed equally as well and had a fabulous experience, the dance competition was awesome! Well done Miss Meah who did all the choreography. Check out year 6 practising their ‘Bad’ dance for the Great Big Dance Off regional heats. 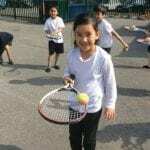 Summer is here and tennis has started, year 3 are having a tennis lessons for 4 weeks learning new skills and techniques with a specialist tennis coach. They love it! 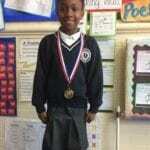 Well Done Jaeda-Lei who came 1st in her gymnastics competition last weekend. An amazing achievement, so proud of you 🙂 and a fabulous medal.